In 1861 Tiffany was making a small number of watches in a workshop in Geneva. 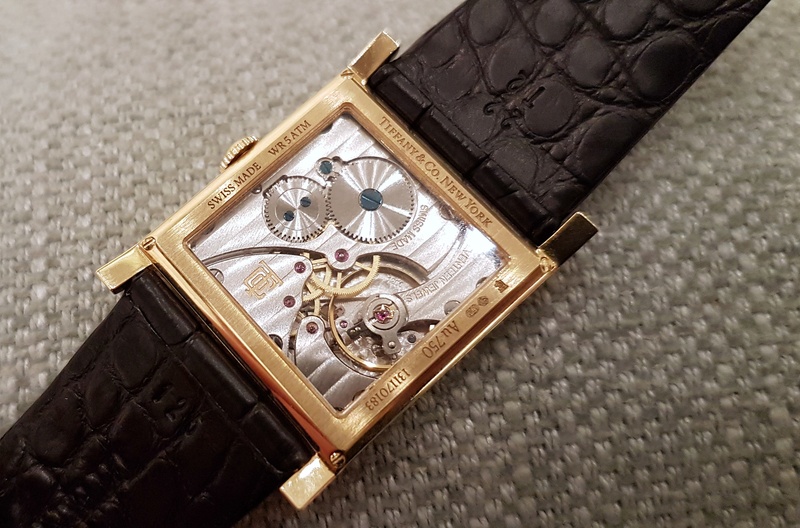 Nowadays, awareness of its watch history may be inextricably tied to its New York boutique and certain storied watch brand names, but a couple of years ago, they set up a watchmaking division (and factory) in Switzerland. With it came the launch of the CT-60 chronograph collection in 2015, which has been followed by other releases. 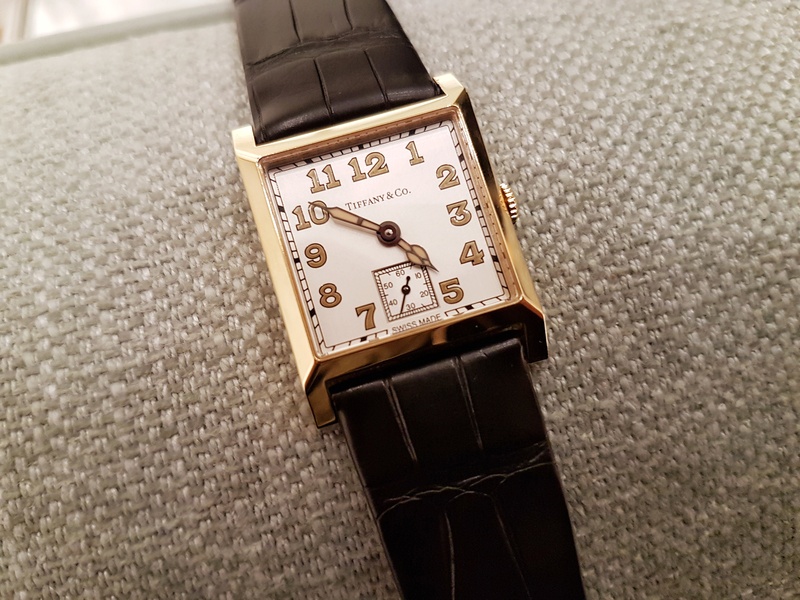 The use of third party movement suppliers for their watches clearly wasn’t intended to be a long term plan, and the recent announcement of the Tiffany Square Watch not only marks a return to in-house movement manufacture, but does so courtesy of a square, not round, movement. 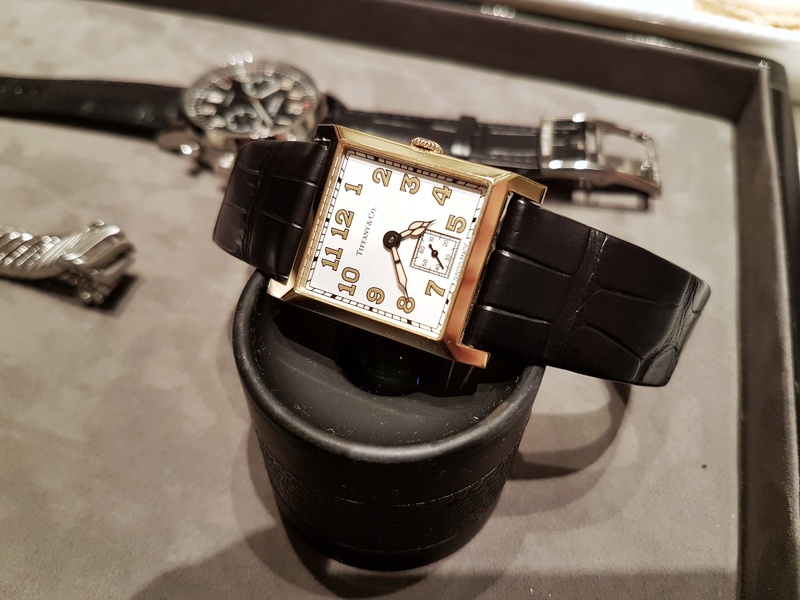 Created to mark their 180th birthday, this new timepiece is inspired by a 27mm square case released by Tiffany & Co in the 1920s and is, accordingly, in a limited edition of 180 pieces. There are currently four prototypes travelling the world, and through chance and good fortune, we recently managed to see one of the four here in Sydney. This modern version measures 28mm x 35.8mm, and is a very slim 6.9mm thick. The case is yellow gold, with a combination of polished and satin-brushed surfaces. 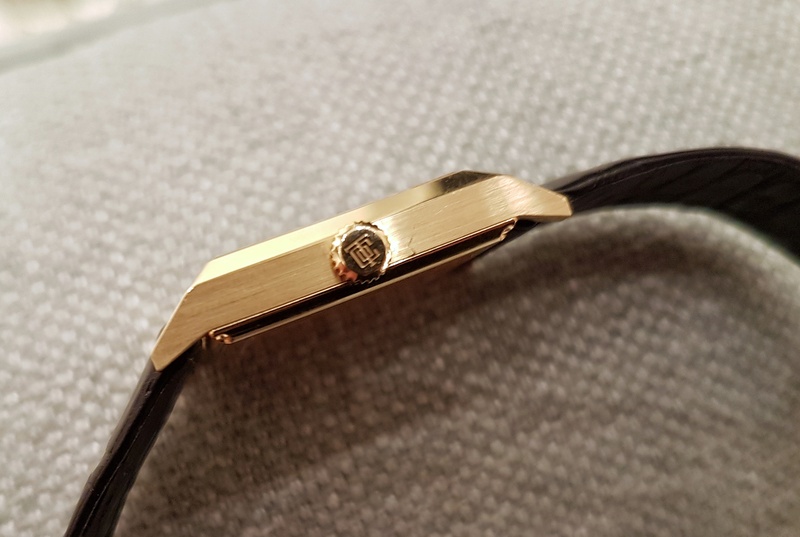 The polished bezel is angled so that there is an uninterrupted line down to the lugs. Its dial has a brushed white finishing with ‘powdered gold’ Arabic numerals and cathedral hands which are filled with a ‘vintage look’ lume. Framing the dial is a railway minute track, and there is a recessed square small seconds sub dial at 6 o’clock, also with its own railway track. Flipping it over, the open case back reveals the Manufacture manual-wind Calibre TCO.1874M, which is decorated with Côtes de Genève stripes and perlage. It beats at 21,600VPH and has forty-two hours of power reserve. The Tiffany Square Watch sits firmly and unashamedly as an homage model to the point of maintaining a period-correct case size. Its small size was, in fact, one of the reasons for the preconceptions I had about the Square before I saw it. 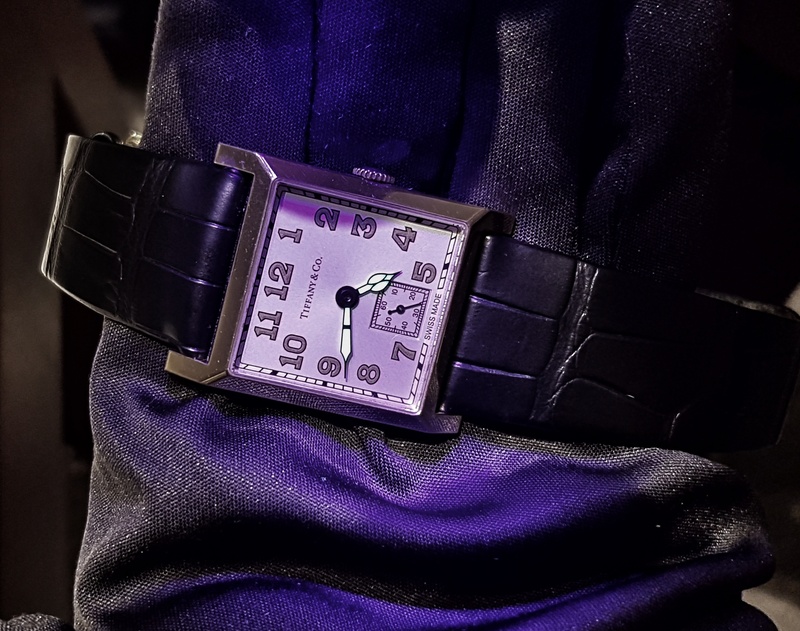 Although I like the classic white dial and cathedral hands look of wristwatches of that period and the 1930s, I wasn’t drawn to the idea of a modern watch whose fidelity to the overall ‘look’ (with the addition of modern lume) extended this far. I thought it was far too small for 2017 preferences, and would look awkwardly small and shiny ‘in the metal’. 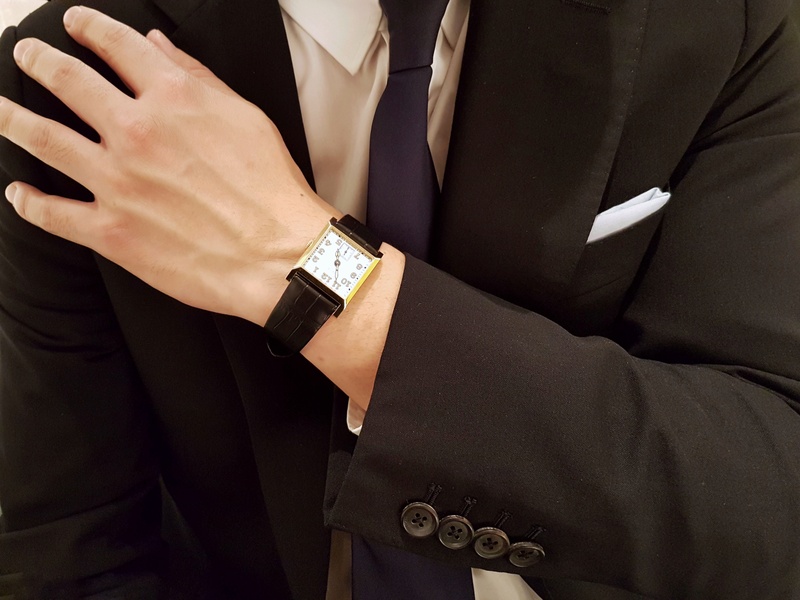 I wore my late 1930s Rolex as a comparative piece. As you can see from the photo below, they are within the same general range size wise (but not in thickness). 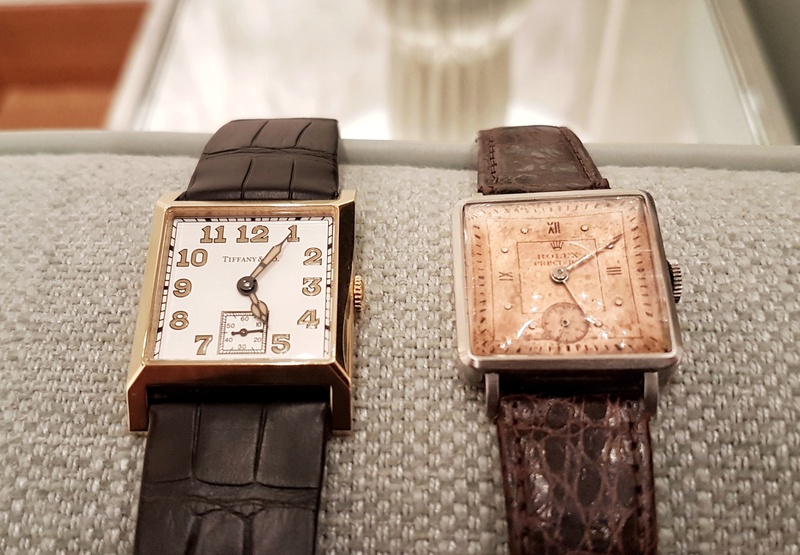 In looking at them together, and also on the wrist of Jacky from Tiffany & Co (it is his wrist in the wristshot below), my views about the Square changed over the course of my time with it. Yes it is small, and yes a couple of more mm would have not have gone astray, but for a male wrist within the average size distribution, worn as a dress watch with a suit, the ‘numbers’ of it all don’t really matter. You can wear it as if it is an actual watch from that period. In reality, it is actually a very unisex watch, and is easily viewed as such when you handle it and try it on. Clearly, many do not find it too small, as a majority of the 180 pieces have been pre-sold already, many to existing Tiffany & Co customers (not unexpectedly). The Tiffany Square comes on a (double-sided) black alligator strap and has a retail price of USD 18,000. If you want to know how seriously Tiffany & Co are taking this particular watch, they entered it into this year’s GPHG.